Cape Town has many small nature reserves quite close to town. Most of them have different things to see and some of them have quite a variety of wild life. 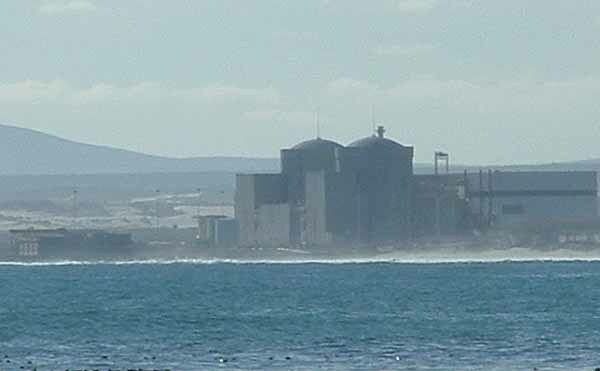 Today we will visit the Koeberg Nature Reserve which is on the grounds of the Koeberg Nuclear power station near Melkbosstrand on the west coast of the Western Cape. To get there one must drive up the west coast road past Milnerton and Bloubergstrand a distanceof about 30 kilometres. The entrance to the reserve is near the town of Melkbosstrand. The Reserve is approximately 3000 hectares in size and is on Eskom grounds. To assist visitors in seeing everything of interest various trails have been marked out. A mountain bike trail for those who like riding in the bush and two walking trails for those who love hiking. The walking trails are named Grysbok (Grey Buck) and Dikkop (thick head). Dikkop is a species of bird which is quite well known in the area. A while back a pair of them set up a nest on an open field next to our house and managed to raise two chicks between building operations and all the neighbourhood cats. They are very protective birds especially when they have chicks and they are quite prepared to take you on should you approach their nest. They build their nests on the ground so it is quite easy to step on their eggs if they don't protect them. The Dikkop trail has been marked out with 16 markers with each marker being the centre of a specific area with something unique to see. This trail runs along the dune line which seperates the sea from the land and here one can see the different species of grasses which keep the dunes from being broken down by the strong south east winds which blow during the summer months. Other types of vegetation are the hardy Cape Reeds which are part of the Fynbos in the area. Fynbos being the indigenous plants found in the Cape area. On the dunes you will also find the Metalasia muricata (blombos or english translation flower bush) This bush produces a bright yellow flower which gives off a scent that smells like honey. The main characteristic of this bush is the fact that it grows on the dunes and helps to stabilise them. The Grysbok trail has other things to see. Along this trail are the dune crests along the beach which were formed over a 100000 years ago. As climatic conditions are different on the dunes to elsewhere in the reserve you will find that the plantlife is much shorter there than elsewhere in the Reserve.. The beach which runs along the western boundary of the reserve is the breeding site of various sea birds including the Black Oyster catcher which is on the threatened list. On this route there is also a saltpan which supports a sensitive ecosystem. In the winter months when the Cape gets its rain there is an abundance of birds visiting the pan. I have failed to mention some of the wildlife that you may come across while walking through the reserve. There are a number of different species of buck in the park which include Springboks, Bontebok, Eland and Impala. You will also find the odd donkey with its jamas on . (zebra) There are a number of predators in the park but none of the larger cats. They are the African Wild cat, Grey mongoose and Genet. The Caracul is a small cat about the size of a Labrador dog and is the largest of the predators in the park. In Afrikaans it is called the Rooikat(Redcat) and has sharp pointed ears. When I was a child in Kommetjie these cats used to attack our chicken coops and kill the hens. Occasionally you managed to corner one and then you had a very mad and dangerous cat on your hands. Being a wild bushy place you will no doubt come across some of the snakes that inhabit the area. They are the very poisonous Cape Cobra and the Boomslang(tree snake). Other varieties such as the Skaapsteker (sheepbiter) and the mole snake are not poisonous. The Mole snake can get quite big up to about two metres in length with its main prey being moles which live in the sand. There are also many tortoises in the area. For birdwatchers there are 172 species of bird in the reserve and many of them can be seen at the Salt pan. Would you like to spend a day or two walking in the wilds and be able to have the luxury of your hotel at night. Koeberg Nature Reserve is the place to visit.